Vera2 UI5 factory reset with the rear button. 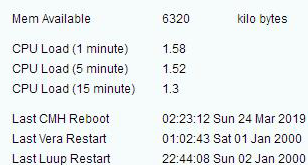 Power is on, ETH1 flash, Zwave on ==>all must be OK.
How is it possible to ‘‘reactivate’’ the Web Access on ssh? Is it possible to restore a back up from ssh? I answer from my self. Firmware flashed and all Firmware updates to be same stage as before. But date is always 31/12/1999. Restore my backup. Every thing OK but same problem as before: no login to account and date 31/12/1999. Thanks Sorin for your kindly reply. Don’t understand why they control online the date and hours at the power cycle reboot …with no manual adjustment possibility, under ssh the date go back too after change. Hi. I have a very flaky internet connection: sometimes it’s now working good and if the Vera reboots, I have problems with time. I found a couple of very old posts about changing to a local NTP server, but I’m not sure if that’s the right direction. I have a synology NAS, so I think I’m covered. I can also install it on my local ubuntu server. I’d prefer a way to automatically re-install after a firmware upgrade. Any help is appreciated. Thanks. I got a CMH reboot in the night 24 March 2019, since no more possible to log on the Mios Account.